Vice-President Yemi Osinbajo is in the U.S. to deliver a lecture at the Harvard University, Boston, U.S. on “Africa Rising” course at Harvard Business School. 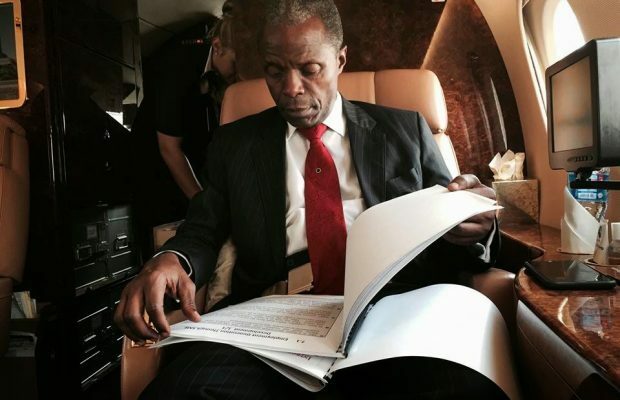 Osinbajo, while at Harvard, would also engage in marathon meetings at the Ivy League school. Harvard described the lecture as a historic moment as it would be the first time that an Africa-focused course would be offered at Harvard Business School. In extending the invitation to Osinbajo, Harvard noted that it deeply admired the immense progress that Nigeria had made under the administration of President Muhammadu Buhari. The university specifically noted the work of the Presidential Enabling Business Environment Council, which the vice-president chairs. The university said: “It would be the highest honour for us were you to accept our invitation as we deeply admire the immense progress that Nigeria has made during your tenure. “Not only as the country’s Vice President, but also as Chairman of the Presidential Enabling Business Environment Council. The vice-president is expected to, during the lecture, highlight the progress made by the present administration in improving the country’s economy and investment climate. Osinbajo had in October 2016 delivered a lecture at the university’s ‘Nigeria in the World’ seminar also at the invitation of the university. The vice-president spoke on: ‘Destroying Boko Haram and the Rebuilding of Nigeria’s North-East’. While at Harvard, he would hold meeting with Margot Gill, the Harvard University Marshall and Prof. Emmauel Akyeampong and the Centre for African Studies Affiliates at Centre for African Studies at the university. He also would have lunch with the Harvard Law School Students and Faculty at the Harvard Law School. Osinbajo would then hold meeting with Prof. David Wilkins and tour the Centre on the Legal Profession and Nitin Nohira, Dean, Harvard Business School at the university.